Sally Christie is very good at opening paragraphs. "I saw a real live fairy," he said, "and I took it home in a bag." Well, what would you think if someone said that? If it was someone you knew - a friend - you might say they were joking. But nobody knew Matt Barker. No one could guess why he'd said what he'd said. Was he attention seeking? Was he a show off? He didn't look the type. This has it all: a mystery, perhaps a way into a fantasy, and above all, the introduction of a character we're immediately anxious to know much more about. The scene takes place on a school bus on a school trip and it's part of a game called the Truth Game in which everyone has to tell the truth. From that beginning, we're drawn into a wonderful mix of the ordinary and the extraordinary: school life and the life of nature around us, young protagonists who are on the edge of adulthood and who need to negotiate the difficult terrain of friendship, and relationships with their contemporaries but who also are still children and open to possibilities in the natural (and supernatural) world that adults would scoff at. Matt Barker has a friend called Jazzy who lives up to her name. She's very outgoing, unlike Matt, and is even playing Ariel in the school production of The Tempest. She's the only person who believes Matt and it's she who accompanies him when he goes up to Burnham Wood, which is named deliberately, I'm quite sure, to have a Shakespearean resonance. While the fairy element is focused on the wood, back at school, Jazzy is having to negotiate her friendship with the cool girls and Matt has to fit into school life, too. He loves football and the story of what happens to him on that front is another thread that's a pleasure to follow through the novel. Matt also has a dog called Dash, who is an important part of the action, and altogether delightful. The school play figures large at the end, and Jazzy's performance opens Matt's eyes to more than another facet of his friend's character. Any young person reading Spirit, quite apart from enjoying a very exciting and involving story, will learn a great deal about Shakespeare and be led, with luck, to wanting to know more. Christie is a most wonderfully economical and resonant writer. She knows that simplicity is more telling than laying on the purple prose. She can summon up a scene with the lightest of touches and you are transported to a wood at night as deftly as you're introduced into a modern classroom. She's also good at dialogue and the children who surround Matt and Jazzy all come to vivid life. Angela, Dip, Mickey and the others inhabit a real world which everyone will recognise. 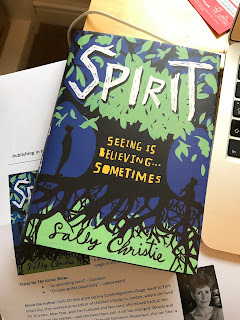 As an afterword, Christie writes this: "This story isn't just about trees, but readers who like explanations for things may choose to interpret it partly as my farewell to the ash." People were worried about ash dieback disease, she says, and they still are. Christie is a passionate advocate for nature and her feelings for trees, plants and the landscape shine out of the book. This novel seems just right for Years 7 and 8, but it works brilliantly for adults too. I loved it and can't wait for Christie's third novel. Oo, thank you, Adele! I must get hold of a copy. Oh, how wonderful! I must get it immediately. I've been waiting so long for Sally to start writing books again. That is a great review of a book I really want to read. Thank you, Adele.